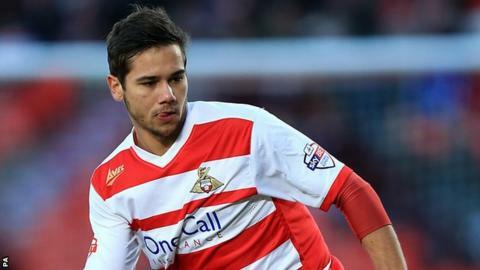 Harry Forrester has signed for Rangers from English League One club Doncaster Rovers for an undisclosed fee. The 24-year-old winger has joined the Scottish Championship leaders on an initial six-month deal. Forrester's previous experience of working with Rangers manager Mark Warburton at Watford and Brentford helped sway his decision. "I know how he works and how he wants to play. I knew that style of football would suit me," said the player. Speaking to the Rangers website, he added: "Hopefully this gives me a good platform to play, and coming into the building already knowing what is expected of me helps a lot. "I see myself more as a left winger, and I'm comfortable there but I've played inside in the number 10 position too, so I'll play wherever the manager wants me too when I get on the pitch. "I'm sure he has his own ideas but he knows me well enough to know where I can play." Forrester, who has scored one goal in nine appearances this season, once spent an eight-game loan period with Kilmarnock in 2010.